In the winter of 2010, snowstorms in Boston resulted in adverse road conditions and traffic delays, causing parents to worry as to the location of their children riding home on public school buses. During the blizzards, Chris Osgood, co-chair of the Mayor’s Office of New Urban Mechanics (MONUM), was at the Boston Public Schools Call Center relaying the GPS locations of school buses to concerned parents. Chris and his colleagues realized allowing parents and caretakers to view this information on a smart phone or computer would be an improvement to the system, especially in critical weather situations. MONUM pilots experiments in the areas of civic engagement, education, and improved service delivery in Boston, using cross-sector collaboration to solve issues within cities. A year after the precipitating snowstorm, MONUM had partnered with Code for America, a non-profit of civic minded developers, to work on a series of projects, including an app called “Where’s My School Bus?” MONUM, in partnership with Boston Public Schools, the GPS Provider Zonar, and Code for America (and later, Vermonster), created a free app that would deliver needed information to parents in a safe and expedited way. Today, “Where’s My School Bus?” provides Boston parents with real-time public school bus locations of their children, and city officials report that the app is used by parents 1,000 times a day. Chris’ love for cities inspired his career path and dedication to the public sector. After working in New York City’s Parks and Recreation Department and spending time at McKinsey & Company, in 2006 he joined the Mayor’s Office in Boston where he advanced new approaches to improving municipal operations, while working to increase the rate of civic engagement in the community. Chris co-founded the Mayor’s Office of New Urban Mechanics in 2010 with Nigel Jacob, making civic innovation a major focus for City Hall. Chris’ interest in using collaboration and new approaches in order to solve problems faced by city residents evolved from a professional path that crossed sectors. His firsthand experience seeing the transformative results that arise from collaborations between NGOs, volunteers, and private companies led him to understand how private partners can deliver results on issues originating in the public sector. Chris’ extensive experience revealed the benefits of partnering both with internal and external partners to explore innovative ways to solve issues. Prior to pursuing his undergraduate degree at Haverford College, Chris worked for a year in Boston as a Corps Member of the education non-profit City Year. There, he was part of the team involved in scaling up a program called “Boston Young Heroes,” a leadership development initiative for middle school students . Chris was also familiar with the private sector; he obtained an MBA at Harvard Business School after working between his two years in graduate school at McKinsey & Company. This experience helped him to understand how organizations can best deliver value through understanding their customers, aligning multiple operations, and executing a targeted strategy. Chris’ public sector knowledge of civic program and project management allowed him to understand the privacy concerns of the Boston Public School system. His cross-sector career nurtured his ability to develop partnerships, allowing him to identify and communicate the needs of BPS, Zonar, Code for America, and Vermonster during the collaborative process. Chris refers to an “iterative and experimental approach” as being vital when working with partners across sectors. His experience with small-scale, civic innovation projects in the Boston Mayor’s Office emphasized the importance of a “joint sense of discovery” for different partners – since Urban Mechanics is a relatively new tool used to solve municipal issues, this idea of fostering a learning process for all partners involved proved essential to the iterative nature of the collaboration. Chris completed his bachelor’s degree at Haverford College, majoring in the “Growth of Structures and Cities.” This focus combined disciplines of urban anthropology, city planning, architecture, urban social and economic relations, urban history, and environmental studies – a multi-faceted view of cities which reinforced Chris’ idea that cities represent an “intermingling of different groups and sectors,” and that structural challenges require a multi-sector approach. His MBA from Harvard University helped him to understand how to design service operations that create value for customers, an understanding that he subsequently applied to his work in the public sector delivering “products” to the residents of Boston. Chris’ project management skills allowed him to coordinate rounds of beta testing for “Where’s My School Bus?” When it was time to develop a citywide version of the app, he worked with his colleagues at MONUM to spearhead the recruitment of development firms. He used his strong communication skills throughout the project to correspond between constituencies with different priorities. Chris’ fluency in the technical language used by specialized groups such as Code for America proved integral to project success – while working on an app called “Citizens Connect,” he translated the expectations of residents and City representatives to the developer team working on the app to ensure that their expectations were in alignment with product development. Chris emphasizes the importance of being open to new ideas, and a willingness to partner with other sectors in order to scale ideas. Throughout his career, Chris wanted to get a sense of the roles and opportunities that each sector has in building cities. Both academically and professionally, Chris has explored a plethora of routes in improving city service delivery, uniquely applying a consumer-oriented understanding of service delivery to his public work in the city of Boston. The participants in the collaboration faced a tangible problem – parents wanted to know where their children’s school buses were. The nature of the problem created a clear set of objectives for BPS, MONUM, Code for America, Zonar, and Vermonster. The common goal was to provide a service to the parents of the city of Boston, without violating the privacy and security concerns that might reveal the location of their child to an unauthorized individual. Working with the BPS transportation team, they devised ways to protect the privacy of parents and their children. Since it was a small working group, this issue was easily resolved through conversations between MONUM and BPS transportation, after which a BPS lawyer gave the app the green light to proceed with development. This shared understanding of the issue through a communicative process ensured realization of the ultimate goal of the collaboration. Each project developed by MONUM includes three different participants from different sectors with specific resources; an expert providing critical data, a project manager (MONUM), and a group contributing specialized skills. In “Where’s My School Bus?” BPS took on the role of expert, as it possessed the key data that the rest of the team lacked in terms of parents’ main concerns, the access to the GPS feed of the school buses, and information about how school buses actually work. Carl Allen, Director of Transportation for Boston Public Schools, coordinated the BPS Transportation Department’s involvement. The transportation department of BPS (using Zonar’s GPS data and software) provided the critical transportation data needed for the app to be developed. MONUM connected with Zonar through BPS, and Zonar was enthusiastic about delivering this product. The team at MONUM also included Chris’ co-chair Nigel Jacob and Dana Conroy (previously Advisor to the Mayor City of Boston). Code for America fellows Scott Silverman, Joel Mahoney, Karla Marcedo and Talin Salway provided specialized skills in the form of app development. 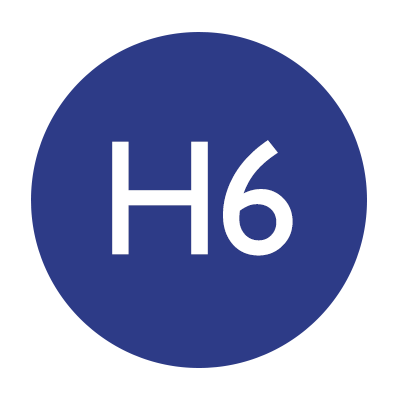 In addition to “Where’s my School Bus?” MONUM managed over 60 civic innovation projects, honing their ability to manage the day-to-day operations of cross-sector collaborations. MONUM provided additional support, such as coordinating beta testing and overseeing logistics for proposals, in order to alleviate some of the responsibilities faced by the BPS representatives who were busy managing the daily transportation issues, eventually ensuring continued collaborative success. After the first version of the app had been developed by Code for America, MONUM worked with Boston Public Schools to identify testing groups composed of BPS parents. The three parent groups selected for rounds of beta-testing also held a vital role in determining the future of the app. MONUM took charge of writing proposals and providing feedback on each round of testing. After several rounds of testing, when seeking to scale the project to the entire city, MONUM issued a Request for Quotation to find a developer to build a more robust platform. This search led the MONUM team to Vermonster. Vermonster created a new version of the app, using feedback from parents as a blueprint for changes. The team that developed “Where’s My School Bus?” was small, and conversations were iterative. Frequent communication reinforced the importance of each sector’s needs and contributions. Despite the fact that Code for America is based in San Francisco, MONUM maintained regular contact with them, and provided direct updates and feedback on the app. Code for America Fellows made several trips to Boston as well. The collaborative nature of the project meant that participants relied on each other to provide expertise in the form of feedback, data, technical skills, project management, and coding the app. By sharing the different competencies of each partner responsible for a specific task within the collaboration, the leadership demonstrated how the relationship between BPS, MONUM, Zonar, and Vermonster, was a symbiotic and mutually beneficial one. 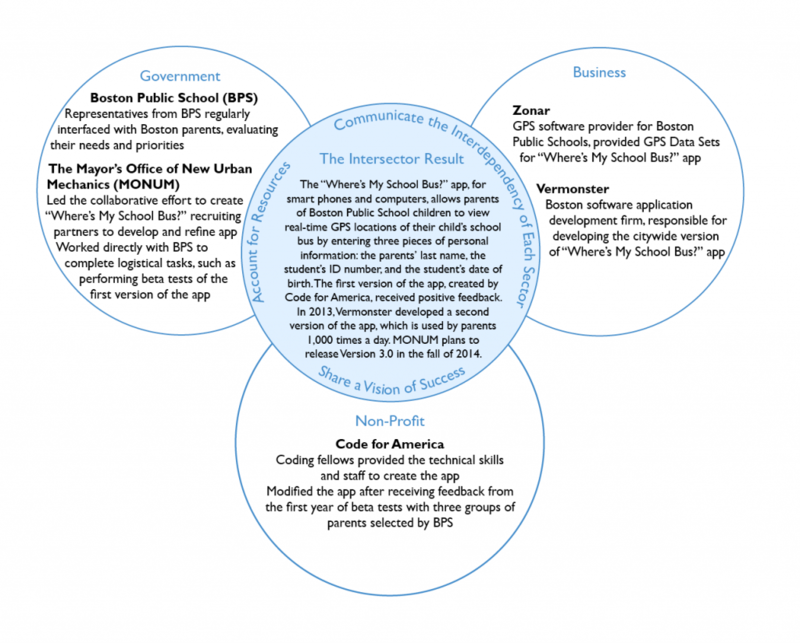 The Mayor’s Office of New Urban Mechanics worked with the Code for America fellows for six to seven months developing “Where’s My School Bus?,” at which point Boston Public Schools and MONUM launched a beta version of the app to three sets of parents group. After receiving positive feedback from the first year of testing with three groups of parents, MONUM and BPS partnered with local development firm Vermonster to launch the citywide version of the app. Over 1,000 uses of the app per day have been reported. Vermonster has designed a mobile friendly front end, which allows for more users of the app. Zonar has released ZPass+, its own version of the app, which is now being used in several other school districts. Chris Osgood reports that the WMSB team has repeatedly seen indicators of increased parent satisfaction (e.g. comments and tweets), regardless of whether the school buses are more timely or not. The team has received additional feedback from users on enhancements they would like to see, and are MOMUM is now working on version 3.0 to be released in the fall of 2014.